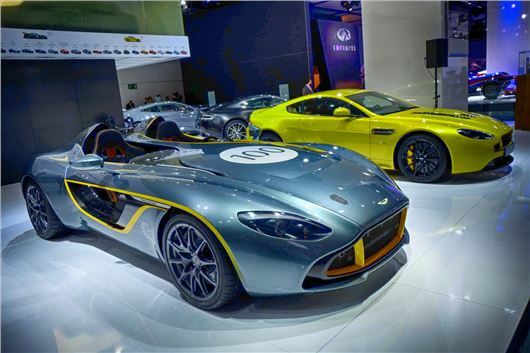 Aston Martin celebrates its centenary in style at the Frankfurt motor show - and although there was no all-new metal to show, it came out punching with new versions of the Vanquish and Vantage, as well as showing the beautiful CC100 Speedster Concept. The the 205mph V12 Vantage S (below), which arrives in showrooms around the world over the next few weeks, becomes Aston Martin’s fastest accelerating series production car, with a 0-60mph time of 3.7 seconds. It's powered by an uprated 573PS version of Aston Martin's 6.0-litre V12 power unit, which features a new generation engine management system from Bosch. Aston Martin promises improved driveability from the V12 Vantage S thanks to improved torque delivery. It has 620Nm available at 5750rpm, but more impressively, there's 510Nm available from 1000rpm. There's also a new Sportshift automated manual transmission, which has been tuned for quicker, smoother changes. The new gearbox is a hydraulically actuated automated manual, with paddle shifters - and Aston Martin says that the transmission system is a direct byproduct of its race programme. It's also 25kg lighter than the outgoing six-speed manual gearbox. There's now three-stage adaptive damping, offering ‘Normal’, ‘Sport’ and ‘Track’ modes, and it also varies the amount of steering assistance offered. ‘Sport’ mode is controlled via a button on the centre console that alters throttle response, gearshift speed and timing, and exhaust note. The Vanquish Volante (below) was the other Aston Martin debutant. The range-topping GT will also be arriving in Aston Martin showrooms in the coming weeks, with customers in the UK and Europe set to receive the first cars before the year’s end. The carbonfibre bodied convertible is more overtly looking than the DBS Volante, and boasts a number of useful improvements. Amazingly, the boot space has been increased, and with a 279 litre capacity – roof up or down – it's going to go down a storm at the local golf club.